Diamondback 510Sr vs 910Sr Compared – Does The Difference Pay For Itself? 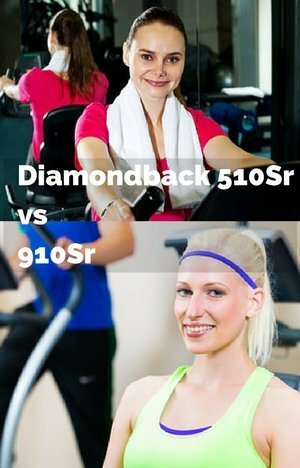 In this Diamondback 510Sr vs 910Sr post these two recumbent exercise bikes are put up against each other and examined in full. The big question being whether those differences justify paying the extra for the 910Sr. There are a lot of similarities with them both using the same frame type so they look alike. The 910Sr is the “upgraded” version of the two. So, obviously, the 910Sr comes with a number of additional features included in the higher price. This is what I go through in this post to help you decide between the two. This bike has been around for a number of years and has been well rated by customers. It comes with a number of good features. It has an adjustable seat that allows you to fit the bike to a range of people between the heights of 5ft 2 and 6 ft 3 ins. The console includes most of the extras you get with the bike – speakers, media tray, magazine rack, fan and charger. It comes with 20 profile pre-set workout programs plus heart rate control programs. It has 16 levels of magnetic resistance. It provides a stable, quiet and low impact cardio workout for a range of abilities from beginner to the more seasoned exerciser. Assembly is easy and overall it seems to be a low hassle bike where you can just get on and workout when you want to. This bike is also well rated by customers and also been around for a while too. You can adjust this bike’s seat while sat on it for the same range of people heights as the 510Sr. With 35 profile programs, plus 3 different heart rate control programs and a fitness test there is more than enough to provide workouts for different abilities and the variety to keep you interested and motivated too. The magnetic resistance, flywheel and belt provide a good fluid riding motion that is quiet. The bike is low maintenance and doesn’t add much time to cleaning duties to keep it looking good and performing well. To help with comfort and support the backrest height can be adjusted. Rather than look at the similarities I’m going to just go through the differences to give you an idea what is different as these are what are going to have the biggest impact on justifying price and which is the right one for you. Weight. The 910Sr is a heavier bike with in weighing in at 152 lbs vs 125 lbs for the 510Sr. Water Bottle Holder. This is probably not a huge issue but the water bottle holder on the 910Sr is a better size and design for getting your bottle out and putting back in than the 510Sr. It has a more of an open bucket design. Resistance Levels The 910Sr comes with more resistance levels with a total of 32 double the 16 you get with the 510Sr. This gives you smaller increments between the levels rather than a wider range of resistance in total. The 910Sr also gives you quick jump buttons to be able to go to specific resistance levels without having to push the up/down buttons. Seat Adjustment. The 910Sr has a much easier and convenient method for moving the seat to properly fit the bike for a person’s height/leg length. You can do it in the seat and use a lever to release it allowing you to mover the seat back and forth until it is in position. You then lock it in place with the lever. The 510Sr is a little more difficult as it is best to do this off the seat. You need to undo a knob and pull it to release the holding pin . You can then move the seat in to position. Then you re-insert the holding pin and tighten up the knob to hold it all in place. Neither are difficult it is just much easier with the 910Sr. Pre-Set Programs. The 910Sr has more pre-set programs with a total of 35 compared to 510Sr 20 pre-set programs. It certainly gives you more variety. It also comes with an additional heart rate control interval programs (in addition to heart level and percentage control programs that it shares in common with 510Sr) and a fitness test (great for tracking progress). Max User Weight. The 910Sr can accommodate people up to a maximum weight of 325 lbs with the 510Sr going up to 300 lbs. Ipad Charger. With the 910Sr you can dock your early generation iPads and iPods to charge them. Both models do have a USB charger for other media devices. Heart Monitoring. The 910Sr gives you the ability to use a heart rate strap with the console. You do need to buy this separately. It does provide a more reliable signal and reading than the hand pulse sensors that comes with both bikes. Media Shelf. The 910Sr can fit Ipad 1 & 2 and other similar sized tablets and smaller devices whereas the 510Sr fits MP3, Ipod and smartphones. Both have the media shelf at the top of the console. Handlebar cushioning. The 910Sr handlebars at the side of the console have a little cushioning allowing you to lean on them when you lean forward. I’d not lean on them too long as they aren’t that well padded. Both bikes get good ratings from customers overall. Unless you are over 300 lbs (up to 325 lbs) then I think I’d look at the 510Sr because of the price. You are missing out on 15 workout programs and the ability to use a heart rate strap in conjunction with your monitor. And an easier method of adjusting the seat. For me that is not a big enough benefit to justify the difference in price. However, if you are going to be moving the seat a lot or like to have plenty of variety with pre-set programs then the 910Sr provides both of those. Or if monitoring you heart rate and using the heart rate control programs then the 910Sr is better because of the heart rate strap. You do need to buy this separately. If the heart rate control programs don’t matter to you, you could monitor your heart rate separately with a heart rate strap and monitor. The table below allows you to see at a glances of the features, dimensions and specifications of the two bike line by line. Hopefully you now have all the information you need to decide which bike is the right one to buy for you. It would be great to hear what you’re thinking is on the bikes.